Founded in 1948, the American Society of Journalists and Authors is the nation’s professional organization of independent nonfiction writers. Membership consists of nearly 1,200 outstanding freelance writers of magazine articles, trade books, and many other forms of nonfiction writing, each of whom has met ASJA’s exacting standards of professional achievement. 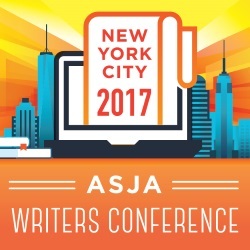 ASJA’s 46th Annual Writers Conference takes place on Saturday, May 5 & 6, 2017 at the Roosevelt Hotel, New York City. More information available here.